It may be the most overlooked of all the features on the Bloody Plain–a forgotten survivor that thousands pass daily without a thought. Union soldiers sought its cover; our own Frank O’Reilly identified and documented it: a low stone wall that offered fleeting shelter to desperate Union troops struggling to and across the Bloody Plain. 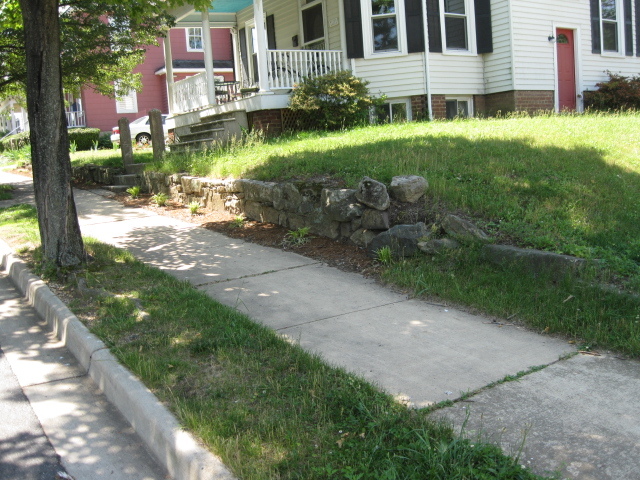 Looking SW, along Weedon Street--is this the remnant of the stone wall that sheltered Union troops and Hazard's Battery on December 13, 1862? For many folks visiting the battlefields, the trenches appear awfully deep to have survived in that condition for almost 150 years. This has lead to the belief that surely they must have been rebuilt by the Civilian Conservation Corps (CCC) in the 1930s or by the National Park Service (NPS) at some other time. Overall, no, there was no wide-spread rebuilding of the earthworks. There was, however, a reconstruction program, for interpretive purposes, of select small sections of trenches on some of the battlefields. There has long been a debate within preservation circles over the ethics of historical reconstructions. Can accurate reconstructions be built? Is there a risk to the historic resources through reconstructions? Can reconstructions best interpret vanished resources? Preservation ethic commands that moving a building ought the last option, borne of desperation and the absence of any other solution. Since the 1950s, when the modern preservation movement in the Fredericksburg area began with the creation of the Historic Fredericksburg Foundation, preservationists in Fredericksburg have come to that unhappy place more than once. The result: a handful of Civil War-era buildings that have shuffled across the landscape, and a few that have vanished altogether. The bank’s kitchen dependency in 1927, when Frances Benjamin Johnston photographed it. 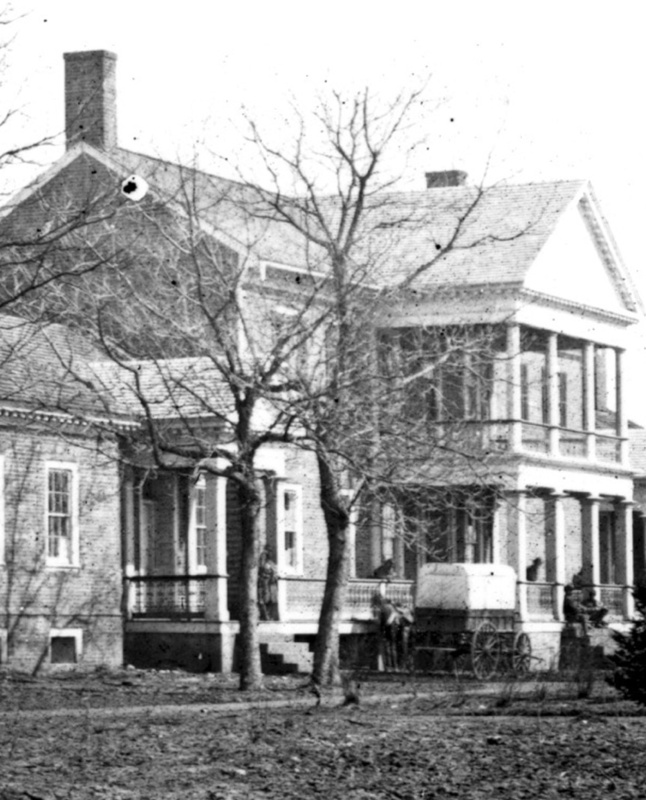 HFFI had its birth in the wreckage of Matthew Fontaine Maury’s Charlotte Street home (from 1835-1842) when it was demolished in 1953 to make way for a prospective Chevy dealership on what is today the back lot of the Post Office. Two years later, the nascent organization faced its first crisis: the impending loss of the kitchen dependency (above) behind the National Bank building on Princess Anne Street, when the bank decided to put in what was probably the town’s first drive-through teller windows (the drive-through still stands). The kitchen quarters dated to 1820. 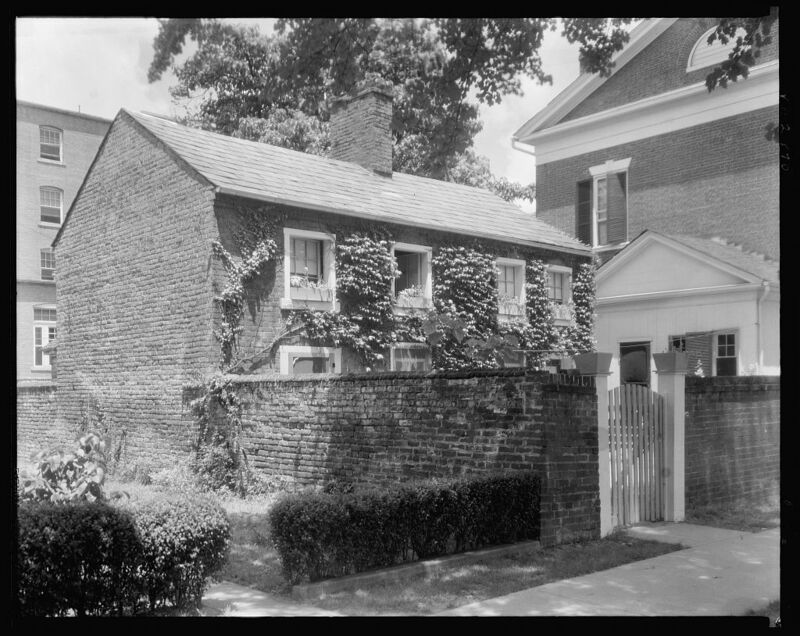 In 1953, though, no one in town recognized that it was also the workplace of the slave John Washington’s mother Sara, and perhaps the birthplace of John Washington himself (Fredericksburg or anyone else didn’t pay much attention to such things in 1955). The bank immediately offered the building to HFFI for relocation, but HFFI refused, choosing instead to fight for its preservation in place. Undeterred, the bank sold the building materials to be recycled, and demolition began. Faced with the total loss of another downtown building. HFFI reconsidered and days later arranged to buy back the building materials from the very building it could have had for free weeks before. The demolished building was rebuilt as a new visitor center at the corner of Princess Anne Street and the then-new Route 1 bypass. It remains today as an insurance office. 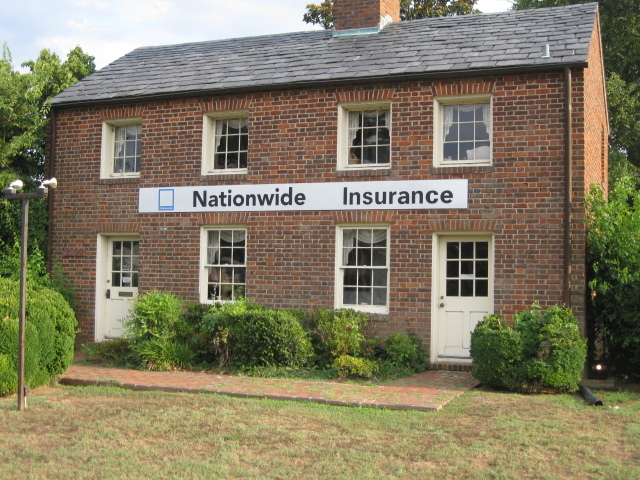 The workplace of John Washington’s mother, relocated and now an insurance office at the corner of Route 1 and Pricess Anne Street. A patriotic end for some cool history stuff: what happened to Jackson’s fence? 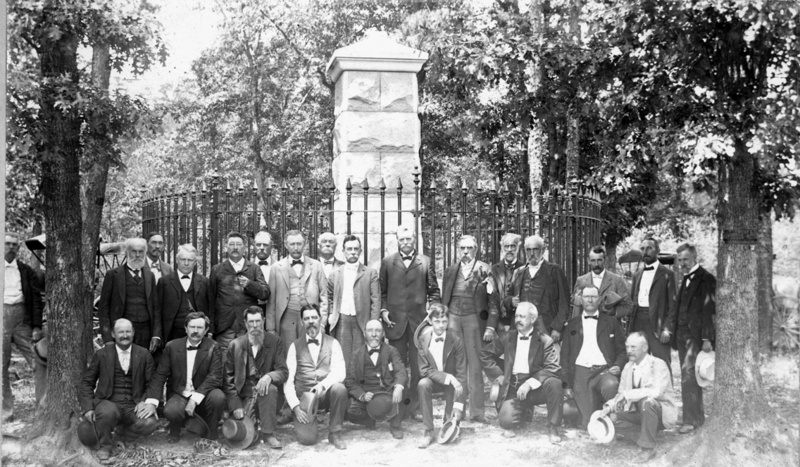 The fence that once surrounded the monument marking Jackson's wounding at Chancellorsville is clearly visible in this image of veterans at the site. On the scale of mysteries, it ranks low, but its unraveling is, at least, interesting. For many years we have wondered at the fate of the decorative fence that once surrounded the monument to the wounding of Stonewall Jackson at Chancellorsville (for an interesting photo exploration of the monument, see John Cummings’s post over at Spotsylvania Civil War Blog). 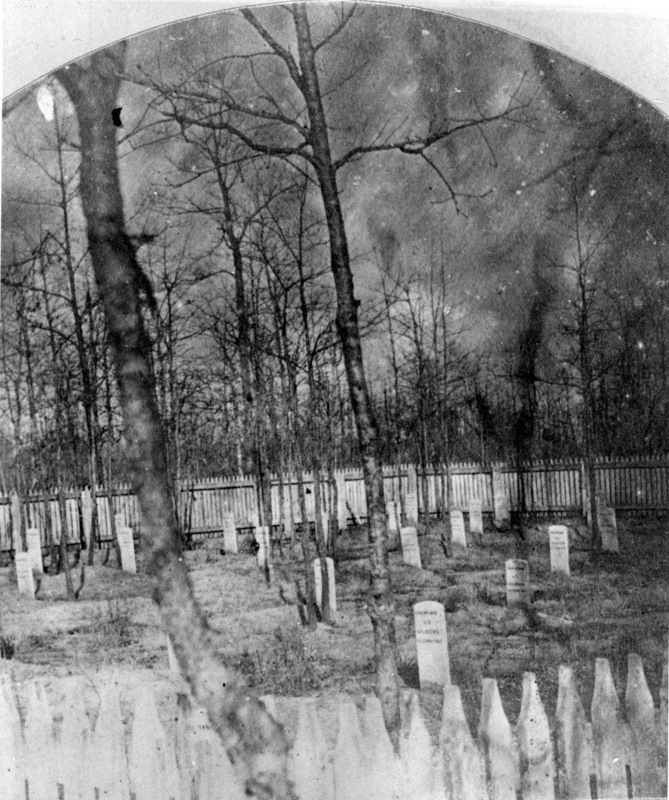 The distinctive fence is visible in early images of the monument. But, clearly, it’s not there today. What happened to it? Rumors and presumptions about the fence had been around for years, but the mystery persisted (at least for me) until last year when I was doing some work on a presentation on Fredericksburg’s homefront experience during the Second World War. 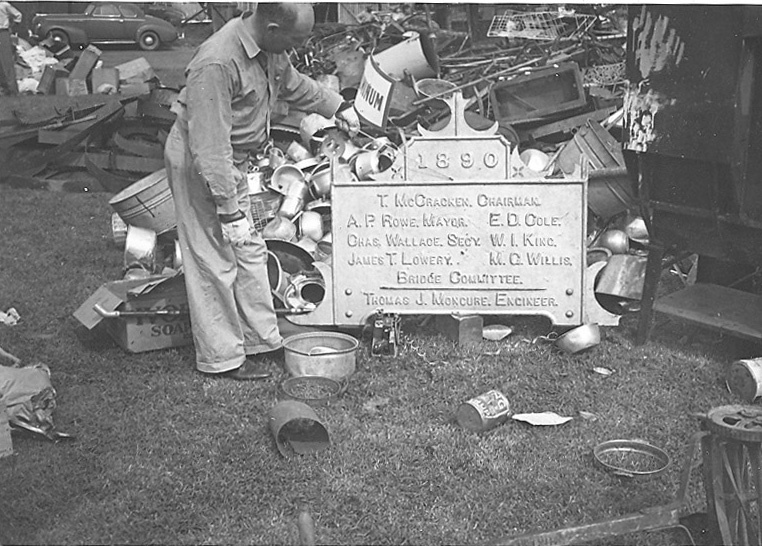 Hunting through the excellent photo collection at the Historic Fredericksburg Foundation, I came across a number of photos of the scrap drive held in September 1942. 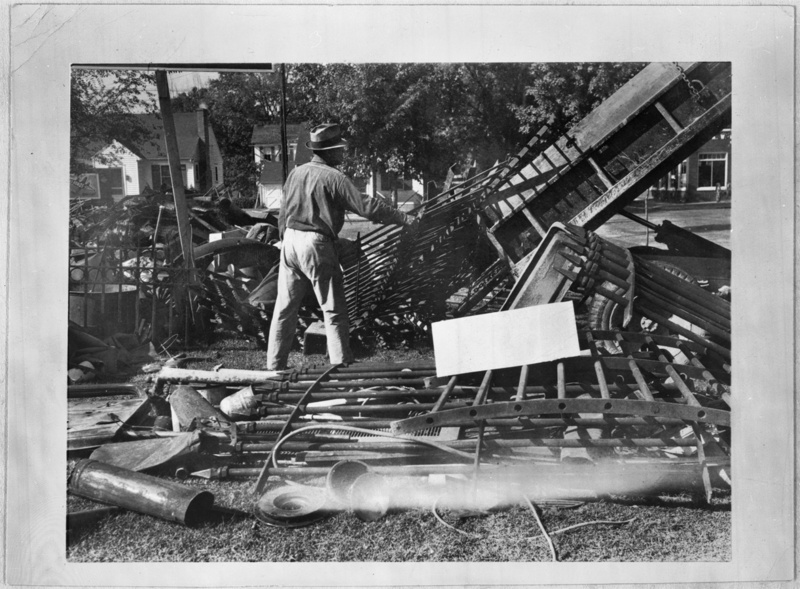 Mystery solved: the fence amidst the scrap in September 1942 Image courtesy Central Rappahannock Heritage Center. In a shot of the accumulated scrap deposited near the corner of Wolfe and Prince Edward Streets, there it was, clearly visible among the detritus: the fence from the Jackson wounding monument. It is a measure of the patriotic fervor of the moment that the NPS felt compelled to peel off some of the historic fabric in its charge to support the war effort. The 122-year old furnace from the National Bank building on Princess Anne Street was one of the biggest items donated–1,500 pounds. It hadn’t been used in at least 50 years. .Judge Alvin T. Embery donated his family’s collection of Civil War cannonballs picked up off area battlefields–….nearly 1,000 pounds of solid shot and shell. Almost certainly, the shells in the collection were still active (no doubt generating a little bit of excitement as they tumbled into the smelter). The Free Lance-Star reported: Herbert and George Haley of William Street donated an unexploded cannonball which they want used to “kill Hitler.”….They thought maybe the newspaper could arrange this…. They found the loaded missile in a creek in Shannon’s Field on the edge of Fredericksburg…. The drive produced more than 463,000 pounds of scrap–more than 100 pounds per resident. Other than actress Greer Garson’s appearance in town for a war bond drive a few weeks later, it was by far the biggest war-related event in town during World War 2. The sign for the old Chatham bridge, donated to subdue Hitler. The bridge had been replaced in 1941, rendering this sign superfluous. Courtesy Central Rappahannock Heritage Center. In two previous posts (found here and here), the possible locations for J. Horace Lacy’s slave cabins at Chatham were discussed. The 1860 slave census reveals that Lacy owned at that time, 39 slaves on his Chatham plantation, 48 slaves at his Ellwood property in Spotsylvania and Orange counties, and hired out 8 slaves to individuals in Fredericksburg. Of the 95 slaves owned by Lacy on the eve of the Civil War, little to almost nothing is known about them. Who were they? Where did they go and what became of them following emmancipation? The names of slaves were not recorded in the 1860 census. We simply have their ages and gender. Tracking them is extremely difficult, but in the case of two of Lacy’s slaves we know that upon securing their freedom, these two men chose to join the Union army. 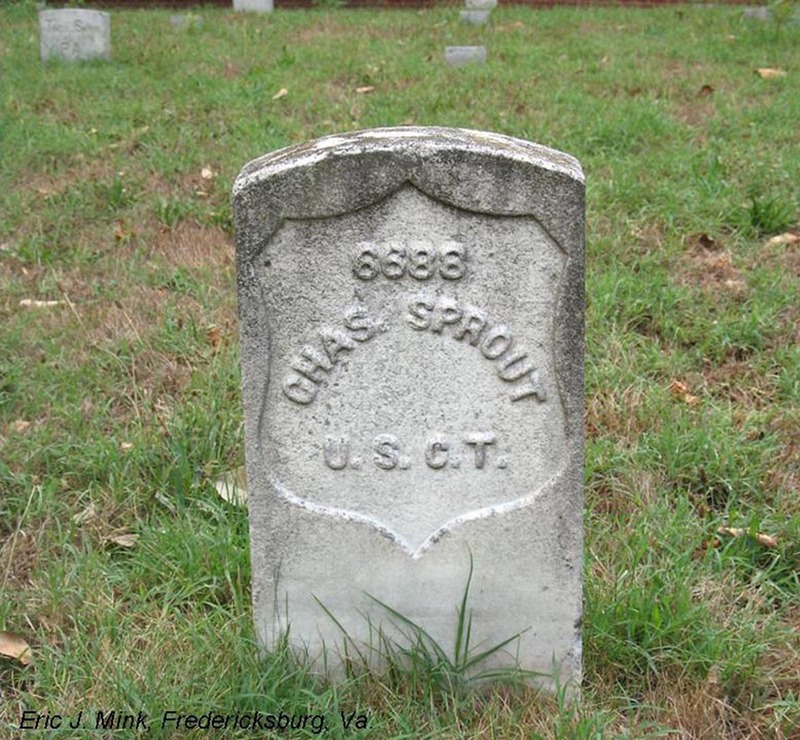 Charles Henry Sprout (aka Sprow) served in the 1st United States Colored Cavalry from his enlistment in 1863 until he was mustered out of service in 1866. 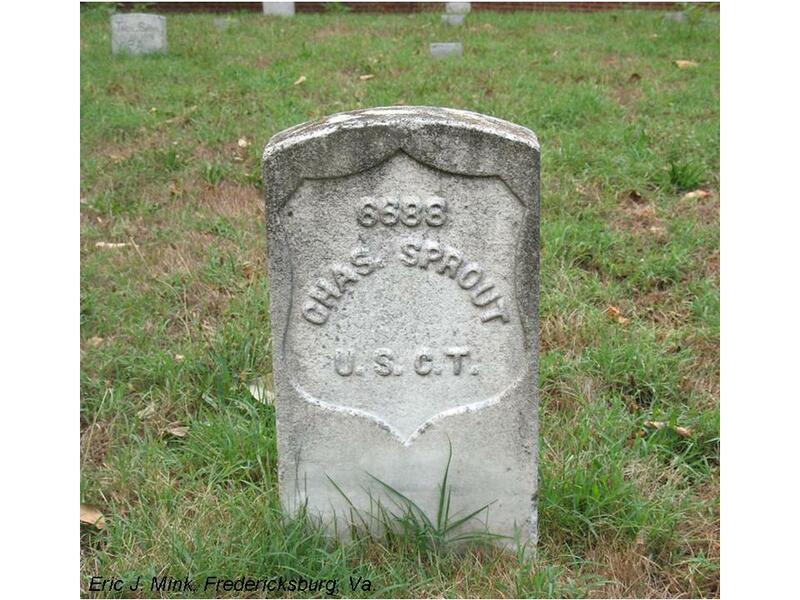 His army service record states that he was born in Spotsylvania County between 1840 and 1842. After the war, he returned to the area and worked as a farmer. His 1926 obituary provided the identity of his prewar owner, as it stated he had been born “into the family of the late J. Horace Lacy…” Sprout is buried in the Fredericksburg National Cemetery. 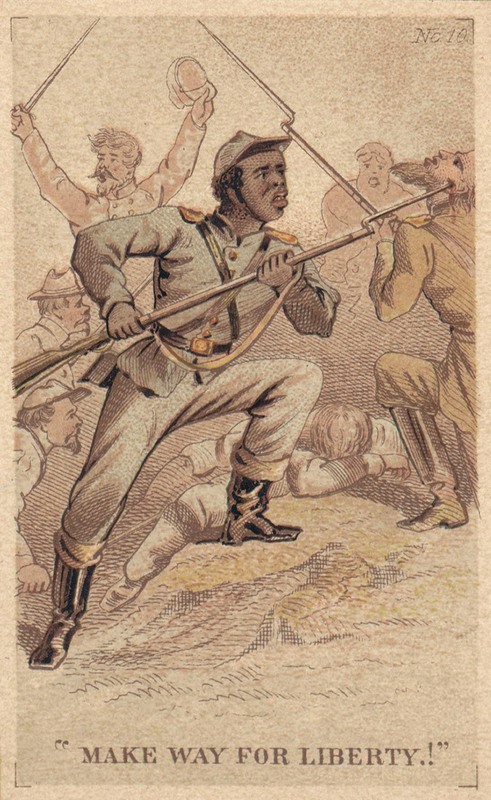 Andrew Weaver is another of Lacy’s slaves who served the Union following his escape from slavery. In Weaver’s case, we are fortunate to have, in his own words, more specific information about his service in the army and his own admission of ownership by Lacy. Here’s a shot of the remnant stump of the adolescent tree, with the ancient catalpas beyond. 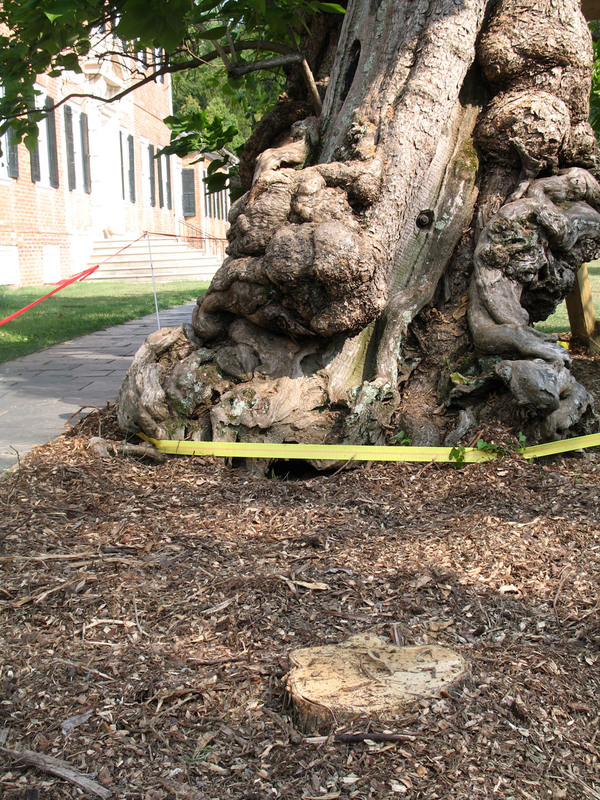 The good news is that the park maintenance staff foresaw the need to plant a descendant catalpa tree next to the ancient specimens that stand in front of Chatham. 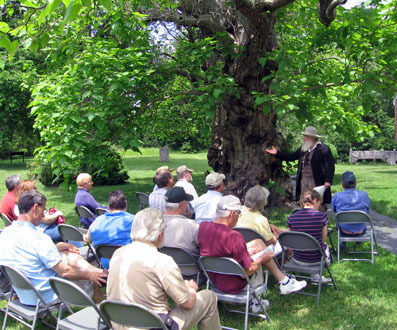 They did so a couple decades ago, and the tree–just north of the pair of catalpas that appear in every Civil War-period image of the place–thrived, achieving a size comparable to its progenitor in 1863 (see historic photo, below). Until Saturday night. And that’s the bad news. 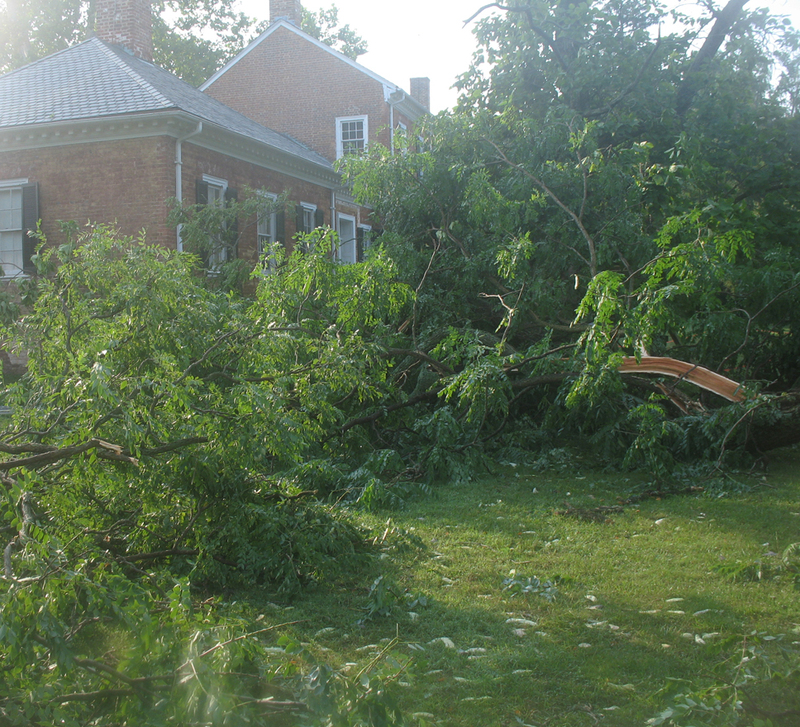 A brief, violent storm ripped off the weighty branch of a huge Kentucky Coffee tree nearby. 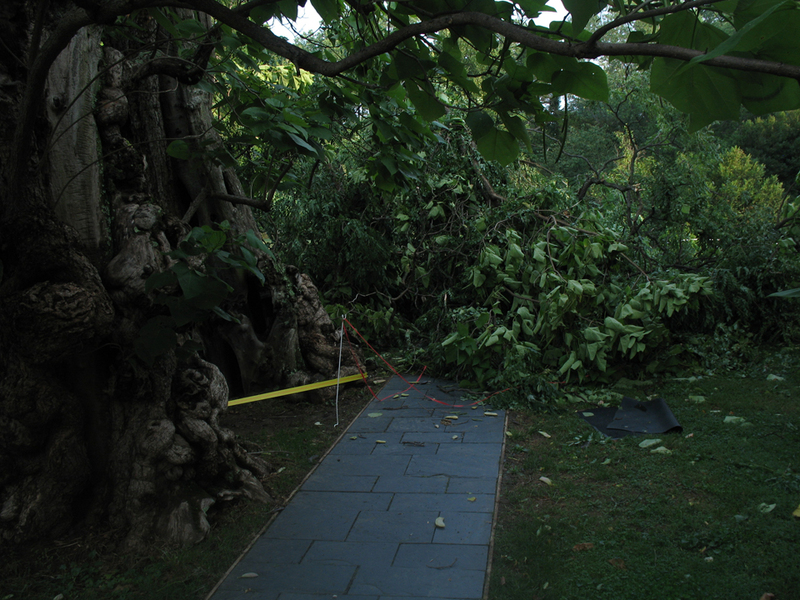 The branch, very precisely, crashed down on the adolescent catalpa, killing it dead. The adjacent grand catalpas survived unscathed. The orginal trees at left; the remnants of the adolescent catalpa beyond. The catalpas at Chatham may be the most famous trees in the region. They are gnarled and curious, imposing and evocative, and the object of much devotion and affection. These are the trees likely mentioned by Walt Whitman in his description of the surgeons at work at Chatham. Over the years, the NPS has put in herculean efforts to keep them upright (they probably have as much metal as wood in them)…but their demise seems to be approaching rapidly. That makes the sudden death of the emerging specimen nearby all the more tragic. From Hennessy: In our last, Noel Harrison looked at the likely role of tobacco cultivation in the creation of the “poison fields” that over time became the Wilderness. In this post we’ll look the nature and extent of the Wilderness in 1860 as it related to subsequent uses–especially the clear cutting required to support two furnaces in the region operating about a century apart. Part of what follows will be based on Dr. Sean Adams’s new (and not quite finished) study of Catharine Furnace, which we expect to roll out to the public later this year. Look not at the cemetery, but at the woods beyond, south of the Orange Plank Road at the Wilderness. Clearly, this forest had been cut in the previous 25 years. This image dates to 1866. 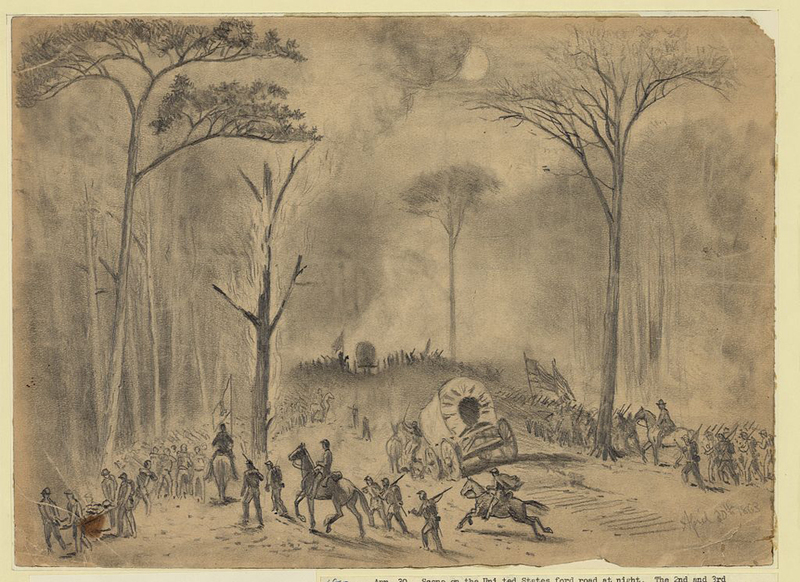 This sketch of Chancellorsville by Edwin Forbes shows a mature forest astride the road. We have a tendency to view the entire region as a largely homogeneous being, but it was in fact many things. Small farms were sprinkled throughout the region, but most importantly for our purposes it clearly was not the singular type of woods so often implied. Digging deeper into the descriptions of the fighting there, it’s common to find references to woods where sight-distance exceeded 50 or 60 yards (it rarely reaches those distances today). At the same time, dozens also described the scrubby, tangled nightmare that most of us associate with the Wilderness. I have always been struck by these varied descriptions–each an indicator of the age of the woods–which begs the question: just how extensive had timbering operations in the Wilderness been?